In early May GHTC and GCAT (Guelph Coalition for Active Transportation) hold a casual bike ride to kick off Spring and enjoy the Magnificent Magnolia Trees in blossom. For added fun there is a costume contest to brighten the day. The ride is about 12km, visiting several Magnolia trees and other Spring blossoms, in and around Downtown Guelph as well as other activities. Ride is mainly on quiet residential streets and trails. Make sure you pack your camera and get some beautiful shots! There will be prizes for the Best Dressed Cyclist, Most Outlandish Ensemble, and Best Spring Bonnet, so get your best outfit ready! The ride finishes with a garden party. Helmets are encouraged. 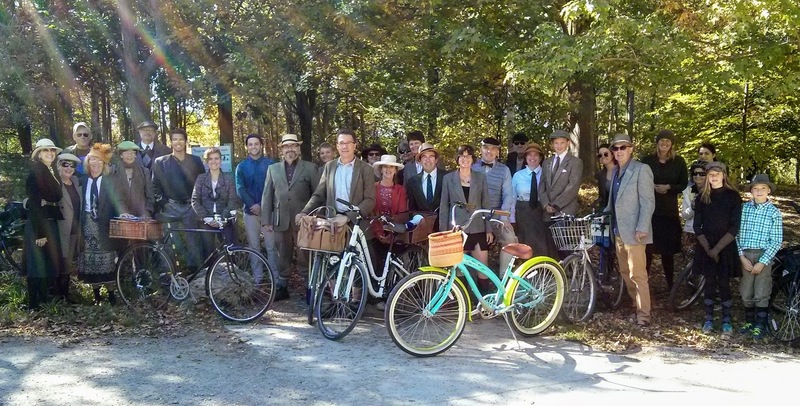 GHTC holds a Tweed bike ride in the fall. Participants are encouraged to dress in their tweeds or old time clothes. A short leisurely ride through Guelph is followed by awarding prizes to best dressed male, female, and bike! Tweed rides originated in London in 2009 and are now held all over the world.